Roads are a major threat to wildlife, but innovative thinking can help animals make it over (or under) them safely. Under cover of darkness, a family of bright-eyed possums traverse a rope bridge strung high above an Australian road. In Canada, motorists look up to see a line of moose picking their way across a green overpass. Elephants amble peacefully down the slopes of Mount Kenya and under a highway, through a huge culvert dug specially for them. These images of wildlife in apparent harmony with motorised transport were among many examples presented during a road ecology workshop at the International Wildlife Management Congress (IWMC) in Durban this week. But the workshop’s message was anything but idyllic: world-wide, humanity’s vast road network (30 million kilometres carrying 750 million vehicles) has a devastating effect on wildlife, and the problem needs urgent attention in species-rich Africa, where road ecology research is still in its infancy. Photo credit: Health24. 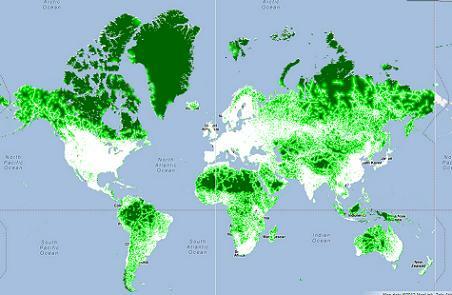 Google Earth's new Roadless Areas Map: green indicates areas at least 10km from the nearest road. Most people are aware of the terrible toll that roads exact on human life, but driving is such a mundane part of modern existence we forget its dangers even to us, let alone to animals. There are 1 million animal deaths per day on the roadways of the United States alone, not including animals that have crawled off the road to die after an accident, or which have been scavenged or removed by humans1. Dr Daniel Smith, a road ecologist from the Department of Wildlife and Conservation, University of Florida, pointed out it is human population, 7 billion and counting, which is the main driver of negative natural landscape change; we have already altered 83% of the terrestrial surface. Much of that changed surface comprises roads. They may seem like narrow two-dimensional strips that take up relatively little space compared with buildings and agricultural areas, but collectively roads have replaced vast areas of land and dissected even more. They are a thus a major cause of habitat loss and landscape fragmentation, with associated biodiversity losses. Roads are repositories for pollutants like tar and motor oil, and contribute to the degradation of adjacent habitat. Road verges, with their noise and fumes, are often areas of high disturbance. This may be a deterrent to native species, causing decreases in population numbers which in turn allows more competitive and resilient invasive alien species to flourish. As they slice and criss-cross through landscapes, roads also fragment populations, with some groups of animals becoming so small as a result that breeding is no longer genetically viable. Some wildlife don’t cross roads, but their presence alters animal behaviour in negative ways. Certain species treat roads as impassable barriers and turn away when they come to them, or even before, deterred by noise, glaring lights, dust and pollutants. Roads are particularly disturbing for far-ranging animals who need to cross them to follow migration routes, to find mates or to hunt. And roads of course also allow humans, with all our accompanying potentially negative impacts on nature, better access to previously remote areas. There has been growing interest in roads and wildlife research over the past two decades in Europe, North America and Australia, but the issue has received little attention in Africa up till now. Curtailing or altering plans for roads to reduce their environmental impact is an especially contentious issue in the developing world, where roads are seen as an important mechanism and symbol of development, and where the majority of the world’s new roads will now be built. The high potential for conflict between conservation and development agendas has been highlighted by the recent debacle over the proposed Serengeti Highway. The first prize for wildlife conservation is to not have roads pass through sensitive areas in the first place. However, many extant roads already do so, and it is unrealistic to hope that new road developments will all be planned to bypass such areas. This makes mitigating the effects of roads crucially important, and it is here that road ecology becomes especially interesting and innovative, with solutions as varied as the animals affected. One of the very few African examples is that of the Mount Kenya elephant corridor, which has re-opened the historical elephant access route between the Ngare Ndare Forest Reserve and the Mount Kenya National Reserve. A large, 14km-long culvert was built so elephants could pass beneath a major highway between Mount Kenya’s forests and those of Ngare Ndare. Game-proof fencing along the sides of the highway “channel” the elephants towards crossing via the underpass. The good news, said Dr Rodney van der Ree, Deputy Director of the Australian Research Centre for Urban Ecology, University of Melbourne, is that such well-designed mitigation measures do work. There’s ample evidence of animals using the crossings from camera footage and tracks. But whether this is helping maintain populations – to answer that, he said, will require further investigation. The other obvious area for change is in driver behaviour, but so far attempts in this respect have met with less success. More effective, he says, are when the warning sign is coupled with a flashing light and motion sensor that is triggered by an actual large animal crossing the road up ahead. Other methods that are used with some success for protecting pedestrians, such as traffic-calming road humps, tighter speeding regulation and safer driving campaigns like Arrive Alive, may also have application for reducing wildlife road deaths. 1. Members of the public often remove animal carcasses from roads. In Southern Africa, says Wendy Collinson of the Endangered Wildlife Trust’s Roadkill Research and Mitigation Project, who has been conducting research in northern Limpopo, the reasons for this are various: to clear the road for the safety of other drivers, for food, and for muti – sometimes body parts such as paws and tails are removed from road kill for this purpose.